On Monday the communist New People's Army (NPA) attacked Philippine mining company operations on the southern island of Mindanao. Such raids are of themselves not unusual - MAC has covered more than its fair share of these incidents: see for example: More violence at Xstrata's Philippine project. However, this one has gained much notoriety and press coverage because of both its scale and the choice of targets, which included Sumitomo Metal Mining's Taganito project. Commentators have highlighted the NPA's claim that to be punishing such companies for their crimes against the local communities and the environment (noting the companies had been fined for polluting Claver Bay). Unfortunately the Chamber of Mines chose to condemn NGOs who are critical of mining, claiming they have "emboldened the NPA (New People's Army) to believe that protection of the environment can justify their attacks on mining companies". This is hardly likely to help in a situation here non-violent activists still face the risk of extra-judicial killings for being - wrongly - associated with armed rebellion. "It's like a Pearl Harbor of the mining industry," said a Surigao del Norte-based industry source who inspected the compounds of Taganito Mining Corp. (TMC) and Platinum Group Metals Corp., (PGMC), in Taganito, Claver, the day after the raids. The source added this was mining's "day of infamy" and the "singular most devastating attack on private investment mounted by the NPA." The estimate came from the assessment of vehicles, physical infrastructure as well as barges or tugboats that were burned down. Inquirer sources said TMC lost 41 dump trucks, on top of other major equipment while PGMC lost 91 dump trucks and nine barges. The PGMC, likewise, lost 18 firearms to the communist rebels. 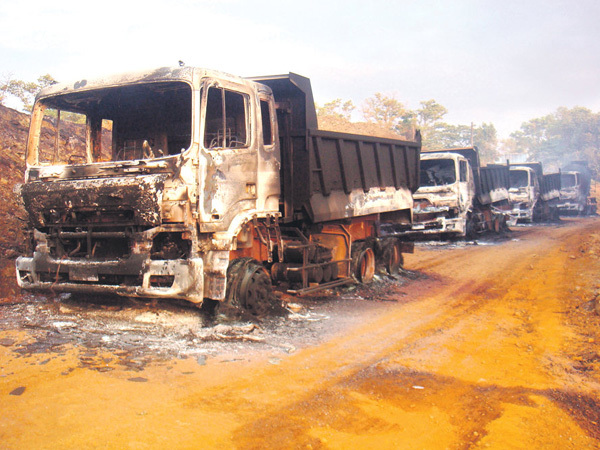 The majority of equipment burned belonged to the two mining companies while the subcontractors were spared. The attack triggered rumors that the Sumitomo group of Japan, the foreign partner of Nickel Asia Corp., the parent company of TMC, would pull out its investments from the country but this was denied by the local nickel mining giant. "Of course not," Nickel Asia president Gerard Brimo said in a short phone interview. "If that's true, we would have disclosed that and we haven't." Sumitomo Metal Mining Co. Ltd. owns around 25 percent of Nickel Asia. The Japanese firm is also the controlling stockholder of the Taganito HPAL Nickel Corp., which has been building a $1.3-billion smelting facility that uses high-pressure acid leaching (HPAL) process, a technology that enables the recovery of nickel and cobalt from low-grade nickel oxide ore. When the raids happened, the project was 65-percent complete. Brimo said he could not issue a statement at this time on the magnitude of the damage on Nickel Asia. "We're still assessing the damage. We'll disclose in a day or two," he said. Nickel Asia has a 22.5 percent equity interest in Taganito HPAL, which was scheduled to commence commercial operations at full capacity in August 2013. The facility is expected to produce approximately 30,000 tons of contained nickel in 2014, the first full year of commercial operations at full capacity. There are numerous contractors and subcontractors in the area. Sumitomo Metal and Chiyoda Corp. have scores of Japanese executives and engineers at any one time. All in all, more than 6,000 local workers are employed in the area. The nearest Armed Forces contingent at the time of the attack was the 30IB Philippine Army Headquarters located in Brgy. Sta. Cruz, Placer, about 50 kilometers away from Claver, ground sources said. However, all 30IB PA elements were attending training, and the area was being "manned" by a small augmentation force from the 402nd Brigade PA. The attack in broad daylight, as it was carried by the son of NPA leader Ka Oris, was seen by local industry leaders as an exercise to showcase the strength of the NPA's young recruits. "One could call this as their "test mission" or "debut" of the young emerging leader. They also exploited the absence of the 30th IB during this time," a source from the ground said. Witnesses said the communist rebels did not speak the same local dialect, suggesting that the attack force was reinforced by contingents from other nearby provinces or regions. One group attacked the PGMC compound, the main force controlled the center at the TMC compound and another group provided lookouts and put up barricades. According to reports received by mining industry sources, the leader of the attack, a certain Ka Edron, used four issues in justifying the attack: a) that mining is destroying the environment; b) low salaries of workers; c) a sentiment in the community to stop mining at all costs; and issues concerning indigenous peoples in the area. The communist rebels allegedly held Japanese nationals on site briefly and told them of these reasons. "There was never a mention of revolutionary taxes. The (communist rebel) leaders kept on saying that they will destroy the mining infrastructure in the area," the source said. As the mining boom in Caraga and Surigao areas continues, businesses are concerned that the communist rebels would thrive through extortion activities and use the anti-mining platform as reason for their existence. Since the mining boom in 2010, there has been a rising number of New People's Army-related-incidents in Caraga. Local leaders said miners have been asking for a sizable AFP security force with naval capability that would be permanently stationed right in the area (a particular request from the mining companies). They also urged the national government to use diplomatic channels to explain to the Japanese government and foreign investors about future proactive security and pacification measures. "The provincial government, with assistance from the national government, must also address the plight of displaced workers and render financial assistance to affected families," the source said. 9 a.m.: The NPA led by Ka Edron (son of George Madlos a.k.a. Ka Oris) onboard two dumptrucks barged into the TMC compound while others were posted on the mountain ridges. - Estimated attack force was 200 to 300 cadres (between 15-25 years old, male and female, wearing fatigue and police uniforms), with M16 armalite and AK-47 rifles. - They raised the communist flag atop company flagpole and took away personal and company laptops, and cellphones of employees. - TMC general manager Jose Anievas asked the rebels to release all other employees in the TMC site. An estimated 5,000 to 6,000 workers started to walk out of the area towards Claver poblacion. - Ka Edron and leaders took Anievas and staff to THPAL construction site to look for the "strike force" (Sumitomo has a 12-member reaction team with high-powered firearms) but failed to locate them as the Sumitomo security manager hid them earlier. - Japanese engineers from two Japanese firms were able to assemble in their quarters. Another group of communist rebel leaders got to talk to them. They were left unharmed. - Some NPA leaders conducted a brief "indoctrination" session among the employees outside the TMC gate. 1 p.m.: After his cellphone was returned, TMC adminstrative officer Rogel Cabatuan called MinDA by mobile phone and Jake Miranda consequently gave the phone to Governor Matugas. - Matugas was able to talk with Ka Edron (leader of attack force), over the phone. - Matugas deployed the crisis team (Jake Miranda, Surigao del Norte Provincial Administrator Ramon Gotinga, and MinDA staff Ireneo Piong) to proceed to TMC. 3 p.m.: Team arrived at the vicinity of Claver, and caught up with advancing army units. The Armed Forces of the Philippines asked for a written request to halt military operations. 4 p.m.: Matugas and the crisis team coordinated with the Philippine National Police and the Armed Forces of the Philippines in halting the military offense at the 1st barricade line. - Upon hearing that the military had halted operations, the NPA rebels took with them Anievas, Cabauatan and the TMC chief of the security on their way out. The rebels and the TMC executives boarded seven vehicles and proceeded north to Barangay Cabugo, Claver. - Crisis team finally arrived at TMC gate as the first government representatives entered the area. 4:30 p.m.: At Brgy. Cabugo, the NPA rebels alighted from the vehicles and Anievas, Cabauatan and the TMC chief of the security were released. The three drove back to the TMC compound. As soon as they arrived, Anievas briefed Robredo. - Fires set by the NPA were put under control soon after. - Crisis Team conducted a head count of Japanese nationals in the area. Ramon Gotinga had a debriefing session with Japanese nationals regarding the attack. 7:45 p.m.: All roads were cleared for traffic. - The crisis team finished its preliminary information gathering. - Around 50 personnel from the Armed Forces of the Philippines and the Philippine National Police were still conducting foot patrol and clearing on the road leading to TMC. 10 p.m.: AFP and PNP personnel finally arrived at TMC. GENERAL SANTOS CITY -- Communist rebels hailed the recent attacks against mining companies in Surigao del Norte and vowed to carry out punitive actions against those that "destroy the environment, exploit the workers and drive away indigenous people from their ancestral lands." "We are serious and determined to protect our patrimony, sovereignty, and the general welfare and interests of the people and the environment. We will use the full potential of the revolutionary movement to carry out these just policies," said Jorge Madlos alias Ka Oris, National Democratic Front (NDF) spokesman for Mindanao. The New People's Army (NPA) under the Pulang Diwata Command (PDC) in the North-Eastern Mindanao Region disarmed guards, briefly held company staff, and torched company offices and heavy equipment during the attacks on three mines run by Nickel Asia Corp. and Platinum Group Metals Corp.
Australian and Japanese officials expressed concern Wednesday over the attacks, saying the incidents could hurt the Philippines' image. "It's awful, I mean it's not only the damage to the equipment but the damage to the reputation of the Philippines that I'm worried (about)," said Japanese Ambassador Toshinao Urabe. But Madlos said the attack was timely and warranted against a "rapacious business interests that ravage the environment and natural resources, and intensify the exploitation and repression of workers, peasants, and the Lumad people." He said the incident should serve as a warning to other big mining operations in Mindanao. Madlos reminded Eastern Mining Corp. in Diwalwal, Monkayo, Compostela Valley; the Xtrata-SMI Mining Corp. in Tampakan, South Cotabato; the San Roque Mining Inc. in Tubay, Agusan del Norte; and the Toronto Ventures Inc. in Zamboanga Sibugay that similar punitive action will be meted out against them if they continue to violate NDF's policy on environment, labor and the indigenous peoples. "Far worse than the mining operations, destructive agri-business companies, such as Dole, Del Monte, and large-scale oil palm plantations which have poisoned our soil, air, and water, deprived thousands of peasants and Lumads of land and means of living, and exploited and oppressed workers, are likewise subject to the same revolutionary policies," he said. Other companies warned by the NDF were Philippine Sinter Corp.-Kawasaki, the coal-fired power plant in Villanueva, Misamis Oriental; and hydro-electric power plants, including business firms planning to put up similar environmentally destructive operations. Malacanang, however, assured investors that security in the country's mining areas will be improved. "We understand their concerns because we're just as disappointed of what happened there, so we've taken corrective actions. We are doing a threat assessment and we'll facilitative if necessary upon the recommendation of the DND (defense department), the AFP (armed forces) and the PNP (police)," presidential spokesman Edwin Lacierda said. He said the military and the police have implemented immediate actions to ensure the safety of mining companies in the country. In South Cotabato, for instance, Governor Arthur Pingoy Jr. assured that police and military personnel in the province are closely guarding the area. "We are trying to secure all, and so we are on guard [all the time]," he said. The governor appealed to the public and mining companies though to be vigilant against possible attacks by the communist rebels, citing the Provincial Government monitored NPA recruitment in Barangay Ned in Lake Sebu town and parts of Tampakan, South Cotabato. Lake Sebu and Tampakan towns are home to huge coal and copper deposits, respectively, with San Miguel Corp. holding rights over the former and Sagittarius Mines Inc. on the latter. Pingoy said government security troops are on top of the situation, noting that internal security efforts were turned over last week to the Provincial Government by the military. Lacierda, meanwhile, said the government will look into allegations of abuses committed by Taganito Mining Corporation (TMC) that triggered the Surigao del Norte attack. In a statement, NDF-North Eastern Mindanao Region spokesperson Maria Malaya said the attack was in retaliation against the TMC, which has "ravaged the area for nearly 30 years." "Instead of remitting P400 million in taxes to the [local government], through sheer bribery, the company is now only paying the local government P40 million. It is only right to punish this company," Malaya said. It was also reported that several environmental groups were sympathetic with the NPA's action. Lacierda maintained, however, that the NPA should not resort to violence in addressing issues with the mining firms, noting there are many pro environment members of the Aquino Cabinet that could have acted on those issues. "All things being equal, you don't have to resort to violence to address those concerns," he said. "(That problem) could have been raised with us if there are violations." But Madlos of the NDF described the Aquino government in the arena of environment as worse than the Gloria Arroyo regime. The NDF spokesman for Mindanao criticized the current administration for conniving with destructive mining companies, such as Sumitomo, Nickel Asia Corporation and SRMI. Madlos said that by allowing the companies to operate and destroy the environment, the Aquino administration shows that not the Filipino masses but the profit-hungry foreign capitalists and their local stooges are its real masters. Around 200 to 300 rebels attacked Monday the TMC in Claver town and destroyed several of the company's facilities, including dump trucks, backhoes, barges, and a guest house. Taganito is a unit of Nickel Asia Corp., which is partly owned by Japan's Sumitomo Metal Mining Co Ltd.
Another group of rebels attacked the nearby Platinum Metals Group Corp., also in Claver. Three hours later, another mine site operated by another Taganito company, Taganito HPAL Corporation, was also attacked by rebels. The attack forced Nickel Asia to suspend its operations indefinitely. In a disclosure to the Philippine Stock Exchange on Wednesday, however, Nickel Asia said it already resumed operations. The military said one of the reasons for the attack was the company's refusal to pay "revolutionary taxes" to the rebels. The Armed Forces of the Philippines found, though, "serious lapses" committed by government forces on the field that allowed for the successful attacks. President Benigno Aquino III then ordered the relief of the brigade commander assigned in Claver, Surigao del Norte, as well as of three police officials. Three mining firms in Surigao del Norte, virtually paralyzed by Monday's attacks by communist rebels, had been notified for violating safety procedures and for polluting Claver Bay, environment officials said Wednesday. But Director Leo Jasareno of the Mines and Geosciences Bureau (MGB) said Taganito Mining Corp. (TMC), Taganito HPAL Nickel Corp. and Platinum Group Metals Corp. had no serious environmental violations that would have prompted the government to suspend their operations. "The government will not allow any mining project to compromise the norms of proper environmental management," Jasareno said in an interview. A day after the attacks, the National Democratic Front (NDF), the political arm of the Communist Party of the Philippines (CPP), said the three firms had failed to answer charges of environmental destruction and displacement of indigenous peoples. Jorge Madlos, NDF spokesperson in Mindanao, said the New People's Army (NPA), the armed wing of the CPP, had found out that the three mining firms had damaged the environment and violated workers' rights and committed other violations. During Monday's attacks, the NPA razed a smelting plant, a guest house, 132 dump trucks, 22 backhoes, nine barges, two cranes, two bulldozers, a compactor and a grader. Despite the damage to its equipment, TMC has resumed operations and is expected to start loading operations of nickel ore within the next three weeks, its parent firm, Nickel Asia Corp., said Wednesday. Nickel Asia president Gerard H. Brimo said the company did not expect a significant reduction in its shipments this year. Brimo informed the Philippine Stock Exchange (PSE) that TMC suffered P500 million worth of damage. Damage to the adjacent smelting plant is being assessed, he said. The $1.4-billion plant of Taganito HPAL Nickel Corp., in which Nickel Asia has a minority stake, is still under construction. Based on quarterly assessments by a multiparty team of the MGB, local government and nongovernment organizations this year, the mines had been issued notices for violation of safety procedures such as the failure of employees to wear helmets, and the presence of dust in the workplace, Jasareno said. Had they failed to rectify these, their operations would have been suspended by the MGB, he said. "These were workplace violations whose impact was not that severe. Nickel ore is mined and then shipped. That's how simple the process is. There are no tailings," he said. "But had they committed serious environmental degradation, like massive siltation of coastal areas, that's a big no-no." The three mines, however, had been issued notices of violation for the pollution of Claver Bay, but they had been fined, and had instituted mitigating measures, according to a ranking environment official, who asked not to be named. "The pollution did not pose a serious threat to life and limb," the official said. Renato Reyes of Bagong Alyansang Makabayan said the government was aware of the adverse effects of large-scale mining in Claver town. Reyes said even Secretary Nereus Acosta, presidential adviser on climate change, was interviewed in connection with a TV documentary on the "destructive effects" of large-scale mining in the town, which was aired on GMA 7's "Reporters' Notebook" on Tuesday night. "From the footage we saw, the environmental destruction was real. The local residents and indigenous peoples were severely affected and were crying out for government help. What was clear from the documentary was that there was no concrete response yet from the government," Reyes said in a statement. Even so, he said a team from the MGB's regional office was now assessing the performance of the mines in terms of their compliance with their environmental compliance certificate (ECC), and environmental protection and enhancement program. "The assessment is precisely to look into their compliance with the ECC, particularly the prevention of siltation and damage on coral reefs, reforestation, and progressive rehabilitation of the environment, and even proper waste disposal," he said. "This is urgent because of what happened." On top of this, the MGB and the Environmental Management Bureau are also dispatching another team this week to assess the social impact of the mines, Jasareno said. The mine sites of TMC in the villages of Taganito and Urbiztondo and that of PGMC in Cagdianao village are within the 48,870 hectares covered by the Certificate of Ancestral Domain Title (CADT) belonging to 17 Mamanwa tribes. The Taganito High-Pressure Acid Leaching (HPAL) plant is just 200 meters from TMC, a sister company. The CADT spans five municipalities-Alegria, Bacuag, Claver, Gigaquit and Tubod. Two other mining firms-Oriental Synergy Mining Corp. and Case Mining Co.-operate within the CADT but were not attacked on Monday. Mayor Rosemarie Gokiangkee said mining firms in Claver town continued to operate albeit in a "slowdown" mode as they grappled with the challenge of salvaging sunken barges and cleaning up mine equipment that lay in ruins. "They (mining companies) are operating but not in a normal capacity. The workers are still reporting pending formal announcements from their respective companies," Gokiangkee said. Dulmar Raagas, president of the Chamber of Mines in the Caraga region, said it was impossible to give a time frame within which mining operations could resume at normal levels. "How could they (mining companies) go back to full operation when almost all of their equipment are gone? Replacing the equipment, including the destroyed barges, is very expensive and will take time," Raagas said. In his report to the PSE, Brimo said the rebels were not happy with the economic progress in Surigao del Norte as a result of the Taganito mining project. "The impact of this (project) on the local economy has been significant and palpable. The populist rhetoric that followed the armed raid is unadulterated propaganda which has no demonstrable basis in fact," Brimo said. TMC stands by its "exemplary social and environmental record for the past 24 years," which has earned the company various awards, he said. MANILA, Philippines -- Troops clashed with communist rebels in the southern Philippines Thursday amid a hunt for hundreds of guerrillas who attacked three nickel mining complexes, alarming the local mining industry. An army soldier was killed and three others wounded in the gunbattle near Esperanza town in southern Agusan del Sur province, but troops captured a New People's Army encampment and 12 assault rifles and hit several of the undetermined number of rebels, military spokesman Col. Arnulfo Marcelo Burgos said. The Maoist guerrillas retreated and were being pursued by troops. It was not immediately clear if the guerrillas were among the more than 200 rebels who laid siege on three nickel mining complexes Monday in Claver town in nearby Surigao del Sur province. They disarmed guards, briefly held employees and torched trucks, heavy equipment and company offices. Those attacks, among the largest mounted by the rebels in recent years, sent the government scrambling to reassure mining companies and foreign investors by deploying an additional army battalion of 500 soldiers and about 100 commando troops from a U.S.-trained contingent to secure remote mines and hunt down the guerrillas. "It was a big blow to the economic activity in the area," Marcelo said. "The massive forces there will ensure a safe and secure environment." One of the companies, Taganito Mining Corp., was forced to temporarily shut down operations after the attack. The company is operated by Nickel Asia, the Philippines' biggest nickel producer, which is partly Japanese-owned. CAGAYAN DE ORO CITY - The daring seven-hour siege of three adjacent large-scale mining firms in Claver town, Surigao del Norte that took place in broad daylight Monday, only showed that the revolutionary movement is not "inconsequential" as government has claimed, a detained peace consultant of the National Democratic Front said. In an interview Thursday, Wilfredo "Ka Paris" Mapano said the attack last Monday was an effective "show of force" which should make government treat the revolutionary movement with more respect as the latter had "effectively sanctioned companies that not only plundered the Filipino people's patrimony but exploited and abused its labor force." "The triple attack last Monday showed that NDF has the capacity to punish corporations where the Philippine government failed to deliver," said Mapano. He also brushed off the allegation that the mining companies' were attacked for their failure to pay revolutionary tax, citing a popular adage: "Do not kill the goose that lays the golden eggs." tax but because it wants these companies to stop destroying what is left of the province's fragile ecosystem," he said. "I believe they gave the Philippine government enough time to deal with the complaints of the residents in Claver and neighboring communities. Thirty years is an awful long time but since the Philippine government has beefed up security for the mining companies instead of listening to the people's demand, the genuine government of the people stepped in," said Mapano. He, however, feared for his safety as well as that of the other detained NDF consultants, saying government might vent their ire on them as the attack had embarrassed the Philippines before the international community. At the hearing of one of his criminal cases, Mapano claimed a fiscal ribbed him for belonging to the same guerrilla front that waged the triple attack. The prosecution, he said, had revived an old request to the court to transfer him to a more "secure holding facility." "They (prosecution) have revived their allegation that I will be rescued by my comrades here at the provincial jail in light of what happened at Claver. The prosecution has requested the court again to transfer me, either to Lumbia City Jail or a military camp," he said. The New People's Army's well-executed raids last Monday on three mining firms in Claver, Surigao del Norte razing a smelting plant, 28 heavy equipment, 132 dump trucks and nine barges, but not physically harming or killing anyone has provoked all kinds of reactions. One good outcome: the incident spotlights the dire consequences of mining operations in the area since 1989 that should jolt the government, and the Supreme Court, into taking urgent positive action. The policy of opening up the country to foreign mining firms needs rethinking, pronto. Failure of the state security forces to stop the NPA attacks, which "dismayed" President Aquino, is a relatively minor issue. Beefing up security around the mines will not solve the problems that prompted the NPA attacks. More compelling are the issues raised by the indigenous peoples and environmentalists against the mining companies including the three that were raided: Taganito Mining Corp., Taganito HPAL Nickel Corp., and Platinum Group Metals Corp. The companies are accused of: 1) degrading the environment, and 2) dispossessing the communities of their lands and water resources, ruining their cultural heritage, and withholding royalty fees due to them. Last May 30, the Tribal Coalition of Mindanao filed at the Supreme Court a petition for a "writ of kalikasan," a novel judicial remedy initiated by then-Chief Justice Reynato S. Puno to aid people who are aggrieved by environmental degradation. The petitioners urge the SC to issue a Temporary Environment Protection Order (stop mining operations) against TMC, PGMC, Oriental Synergy Mining Corp., Shenzhou Mining Group Corp., and Marcventures Mining Development Corporation. They charge these firms with "destroying and polluting (their) ancestral domain... by failing to provide proper siltation venues for their nickel mines, thereby irreversibly damaging marine resources, mangroves, corals and creating serious health risks... to the tribes and inhabitants of the provinces of Surigao del Norte and Surigao del Sur." As proof, the petitioners cite the UP Natural Science Research Institute finding that the water and soil samples taken from rivers and water systems near the mines contained nickel levels that far exceed the maximum acceptable level of nickel in drinking water set by the Department of Health and the Bureau of Food and Drug Administration. The Supreme Court's action on the urgent petition is anxiously awaited. Leaders of the Mamanwa tribe in Claver, interviewed by the Philippine News Agency, affirm the "continuing injustice" their communities suffer because of the mining operations. Datu Alfredo Olorico and Datu Totoy Bago lamented: "Our hope for peaceful living has gone. Our rivers that we used to fish and swim in and to irrigate our farms are gone... Our clean shores with crystal-clear waters... the forest, mountain springs that provided fresh potable water, all gone. What is left is harmful pollution and total environmental degradation." Overall chieftain Datu Heidi, holder of the Mamanwa ancestral domain claim, avers the mining firms have not paid P160 million in law-mandated royalty fees, representing one percent of their net income. From 1998-2010, the mining firms allegedly remitted only P43 million of the more than P200 million due to the communities. Even the Internet provides evidence confirming the communities' grievances. Researcher-editor R. Luis Flores (user name @Liquid Druids) has blogged an incisively critical piece titled, "The Ugly Side of Surigao del Norte." It encloses a Google Maps satellite image of Claver's coastal mountain area with a strikingly reddish hue (which to me looks like a wide gaping wound). This is because, Flores points out, "the entire coastal mountain range is denuded of its forest cover." Having observed the area from a distance last September 22-24, Flores adds: "Claver supposedly has the largest iron mineral deposit in the world, and one can surmise that this denudation of the mountains is partly due to the mining activities that has gone on in the past years." He asks: Who should be called to account for allowing this to happen? For good measure, Flores inserts a three-minute video on Barangay Taganito, taken from a moving vehicle last year and uploaded on YouTube by @taureanfate. It shows the denuded mountains, dump trucks running on the dusty road, and four ships (which load the nickel ore) docked at the pier. The note accompanying the video says: "The first time we passed this place, there were still a lot of ‘red mountains' visible. The second time, almost everything was just flat and lifeless." In an update after the raids, Flores remarks: "While I'm no fan of the NPA (in fact I'm very much against it) I feel assured that there are at least people who are actively struggling against the environmental destruction, for whatever reason." Paging P-Noy: Take note and act fast. MANILA - Resume the peace talks and discuss the damage mining companies wreak on the environment. This was the call of environmental activist group Kalikasan People's Network for the Environment (Kalikasan-PNE) in the aftermath of the recent successful operations of the New People's Army (NPA) against three mining corporations in Claver, Surigao del Norte. Last October 3, NPA guerillas destroyed the mining facilities and equipment of the Tag-anito High-Pressure Acid Leaching (THPAL-Sumitomo), Tag-anito Mining Corporation (TMC), and the Platinum Gold Metal Corporation (PGMC), as part of what it said to be its implementation of its policy related to the protection of the environment and natural resources and the defense of the rights of the Lumad people, peasants, and workers. Kalikasan-PNE said the Government of the Philippines (GPH) should immediately resume formal peace negotiations with the National Democratic Front of the Philippines (NDFP) and together find a peaceful resolution to the environmental degradation and community conflicts brought about by large-scale mining. Kalikasan national coordinator Clemente Bautista said the intensified NPA attacks on mining operations signify the need for the government to immediately address the long-standing negative impact of large-scale mining in the Philippines. "The immediate resumption of the NDFP-GPH peace talks is necessary to push forward the environmental agenda of the people," he said. Clemente pointed out that in recent years, two opposing views on mining have strengthened, with one camp calling for increased liberalization of the mining industry, and the other demanding an immediate moratorium on the destructive operations of big mining firms. "While investors claim that an estimated $20 billion worth of investments over the next five to six years stand to be lost because of permit delays and policy discord, the actual contributions of mining to the economy remain minimal. Mining contributes only one percent to the GDP (gross domestic product) and an even smaller and 0.5 percent to employment as of 2010," he said. Bautista said mining investments have not translated into jobs and domestic growth. He said mining has resulted in massive community displacement, pollution and plunder of mineral resources. In a statement released by the NDFP- Northeastern Mindanao Region (NEMR), spokesperson Maria Malaya said Tag-anito Mining Corporation (TMC) has ravaged the area for nearly 30 years and throughout that period wrought massive environmental destruction in the province. Malaya said the company is responsible for ruining both fresh water and marine sources, destroying mountains as well as committing countless human rights violations against its own workers, and farmers. She also charged the company of deliberately failing to pay taxes to the local government unit in the region. "Instead of remitting P 400 million in taxes, through sheer bribery the company is now only paying the local government P 40 million. It is only right to punish this company," she said. TMC is one of three mining companies of the Nickel Asia Corporation in Surigao del Norte owned by former executive secretary of the Joseph Estrada regime and former congressman Manny Zamora. The NDFP-NEMR in the meantime said the Platinum Gold Metal Corporation (PGMC) has also committed massive environmental havoc and is guilty of labor rights violations." "Millions of tons of nickel ore have already been plundered and shipped to imperialist countries, which has resulted in the total effacement of forest and mountains within its concession, as well as the destruction of rivers and seas. Almost all workers in this company are employed on a contractual basis, and the company is brazenly violating even basic bourgeois labor laws. It has also violated the rights of the Lumads. It is only right that its operations must stop," Malaya said. PGMC is mining nickel ore for foreign buyers with a permit to operate under the name of a certain Mr. Atayde, but is currently operated by one Mrs. Tata Dasmarinas Marahomsar. Finally, the NDFP-NEMR said the nickel-processing company Tag-anito High-Pressure Acid Leaching Plant (THPAL) while owned by the Japanese Sumitomo Mining Corporation operates in coordination with Zamora's Nickel Asia Corporation. Malaya said the processing plant was " a menace to the population and the environment." "First, it uses, in massive quantities, sulfuric acid that is highly toxic to both humans and the environment. Second, this is a coal-fired plant that spews out tons upon tons of highly toxic fumes into the atmosphere. Third, the said plant only processes millions of tons of low-grade nickel ore coming from different mines from the four provinces of Caraga, as they prefer to export high grade nickel ore to foreign countries," she said. Malaya said if the company's mining of both low and high grade nickel ore continues, the region's environment will be completely destroyed. Environmental advocates have been calling for the inclusion of an environmental agenda in the GPH-NDFP peace negotiations, saying that environmental concerns should be included in the draft of a Comprehensive Agreement on Socio-Economic Reforms (Caser). In a roundtable discussion and workshop on the Caser environment agenda organized by Defend Patrimony and other green groups earlier this year in May, the groups called for a moratorium on large-scale mining. "The government must immediately suspend large-scale mining operations and impose a moratorium on the approval of applications during the course of the peace process. Not only will it temporarily stop further destruction of the environment, but will also protect communities near and inside mining concessions," Bautista said. Kalikasan-PNE is also calling for the passage of House Bill 4315, dubbed "the People's Mining Bill" authored by Bayan Muna Rep. Teddy Casino. The proposal aims to reorient the country's current policy on the ownership and management of the industry toward national industrialization and local development. Malaya of the NDFP-NEMR said the NPA and the NDFP are not opposed to mining so long as it benefits the Filipino people and will lead to national industrialization. She also said revolutionary groups are open to talks with all mining companies regardless of whether they are foreign or local for as long as they are willing to fully recognize and comply with revolutionary policies. "On the other hand, we warn other giant mining companies that the revolutionary movement is determined to defend the interest of people, including that of the environment. We also warn contractors who are working for these abusive giant companies that we will not hesitate to disable their mining equipment if they refuse to terminate their contracts with said companies," she said. Meanwhile, environmental groups and residents of Sibuyan Island commemorated the death of anti-mining activist Armin Rios Marin through a mass and program, Oct. 3. Marin was murdered on October 3, 2007 by a security officer of nickel mining company Sibuyan Nickel Properties Development Corporation (SNPDC), while leading a protest against the survey and the approval of special permits to cut more than 70,000 trees. He was a trustee of the Sibuyan Island Sentinels League for Environment Inc. (Sibuyan ISLE), former local councilor and staff of World Wildlife Fund (WWF); and lay leader of a local parish church. SNPDC is the local partner of Australia-based Pelican Resources Ltd. and implementer of a Mineral Productions Sharing Agreement (MPSA) permit held by Altai Philippines Mining Corporation (APMC) for an estimated area of 1,500 hectares. APMC is a subsidiary of Canada-based Altai Resources Inc.
"We remain united against the exploitation of our island. Before Armin died he showed us how to stand firm to protect the future of our children's children. Justice for him is the revocation of Altai's MPSA license," said Domingo Marin, father of the murdered councilor. "Mining in island ecosystems like Sibuyan and neighboring Tablas in Romblon is not sustainable as it endangers the livelihood and lives of communities, our voices should be heard - Romblon says NO," said Msgr. Ernie Fetalino, chairman of Romblon Ecumenical Forum Against Mining (REFAM). Jaybee Garganera, national coordinator of Alyansa Tigil Mina said Marin's death was far from being an isolated case. "It was a consequence of the insistence of large scale mining companies and the previous administration to exploit even the lives of communities. President Benigno Aquino III should consider the revocation of Alta's mining permit," he said. "Mining affected communities will always stand up for their rights because the issue at hand goes beyond economics, for them it is food security, disaster resiliency, intergenerational responsibility and carrying capacity of nature." The Mines and Geosciences Bureau recently issued a Cease and Desist Order to Altai due to complaints from local government units and the Catholic Bishops Conference of the Philippines (CBCP). Advocacy group Bantay Kita has also made an appeal regarding the mining industry, saying that the current policy on mining has not brought promised benefits to the Filipino people. The group said the implementation of the mining law has been fraught with lack of transparency and numerous examples of poor governance and that the process of monitoring profits of the industry has too often served to misinform indigenous communities on the effects of mining projects. "Instead of improved livelihoods and progress, mining has brought displacement and economic injustice to the so-called ‘host' communities. Watersheds and forests have been encroached upon, endangering the health and welfare of both upland and surrounding downstream communities. Compared to the devastation caused by mining projects in their jurisdictions, local government revenue gains are too miniscule to be felt," the group said. Bantay Kita pointed out that the industry is plagued with under-declaration, tax avoidance and tax evasion. "From 2000-2009, the under-collection of excise taxes was 65.5 percent. Among the many defects of the Mining Act of 1995, is that it contains provisions that do not allow the national government to get a fair share of mining revenues. Employing its more than generous gains, the mining industry has embarked on lobbying and media campaigns to mislead the political leadership and the public with statements and advertisements on the benefits of mining. It has even articulated a veiled threat that any obstacles to mining, such as environmental restrictions, will harm economic development," it said. Bantay Kita said that contrary to all the hype in the industry, local governments and communities have not felt the benefits but rather the the adverse effects of mining. It said the communities' experience has led them to take action to protest against the encroachment of actually irresponsible mining projects and protect themselves from their devastating consequences. Bantay Kita explained that according to the MGB, seven out of 16 mining projects in the advanced exploration and feasibility financing stages and 25 out of 28 projects in the development and expansion stages are facing opposition from local populations and their officials. It also said that over 20 LGUs have issued moratoriums and environmental regulations to prevent mining firms from causing further damage to the environment, to livelihoods and to lives in their jurisdictions. "The facts speak for themselves. In the last decade, from 2000 to 2009, mining and quarrying together accounted for no more than 0.91% of Philippine GDP. In the same period, the industry's contribution to total employment was a mere 0.376 %. Unnecessary incentives have also contributed to making the revenue effort of the mining industry to be slightly more than half of the revenue effort of the country," the group said. 5) Effect a moratorium on new mining projects until a mining regime in which present as well as future generations of stakeholders receive their fair and just shares has become operative. MANILA, Philippines-Last Monday's attacks by the New People's Army on three mining companies in Claver, Surigao del Norte, may have serious implications for the peace talks with the communists, Interior Secretary Jesse M. Robredo warned Friday. "The fact is there might be a backlash because in the eyes of the police and the military, what is the point of the negotiations if the other party does not respect the peace talks," Robredo told reporters. Robredo, who has supervisory authority over the Philippine National Police, said operations to pursue the more than 200 NPA rebels who raided the mining facilities, burning buildings, heavy equipment and barges worth hundreds of millions of pesos. Robredo said action of the NPA rebels could not help but cast doubt about their seriousness in achieving lasting peace with the government and ending the 43-year-old communist insurgency. "We can't help but have some doubts," Robredo told reporters on the sidelines of a press conference at the Department of the Interior and Local Government offices in Quezon City. But when asked if he believed the National Democratic Front had sanctioned the attacks, Robredo said: "I can't speak for them but then we are hopeful [that this will be resolved]. We will continue with the peace process." Robredo said the PNP was conducting a security assessment of mines that might be vulnerable to more attacks. "We don't want to reveal exactly what we will do but then I can... assure them we will do what is necessary," he said. He said he has met with the Chamber of Mines of the Philippines to bring up allegations by the communists that the mine companies were violating environmental laws. "We need to address this. In fact, we also discussed the need to engage with nongovernmental organizations and civil society organizations that advocate for responsible mining," Robredo said. The long term effect of the Surigao del Norte attacks, he said, "will depend on our response." "In fact, the President has directed us to attend to all of these initiatives both in the short term, the near term and the long term and toward this end we have done a lot," he said. MANILA, Philippines - The Chamber of Mines of the Philippines yesterday expressed alarm over assertions by communist insurgents that their terrorist attack against three mining firms in Claver, Surigao del Norte last Monday was a retaliatory action for alleged environmental destruction committed by those firms. "The insurgents - whose real intention was to extort money from responsible large-scale mining operators in the area - are clearly riding on the wave of sentiments being advanced by, among others, the Palawan anti-mining movement whose proponent, wittingly or unwittingly, are being used by groups identified with the left," the chamber said in a statement. The "constant propaganda" aired during the last nine months of the advocacy's proponents have "apparently emboldened the NPA (New People's Army) to believe that protection of the environment can justify their attacks on mining companies," it said. In a separate statement, the Philippine Mine Safety and Environment Association (PMSEA), which espouses occupational safety and environmental protection, condemned the rash of violence and extortion against mining firms. PMSEA president Louie Sarmiento urged the authorities to thoroughly investigate "these senseless acts" and "ensure that justice be served." The Chamber of Mines reiterated its member-companies' adherence to the principles of responsible mining and good governance, stressing that they "will never succumb to pressures of whatever form to pay the rebels' so-called ‘revolutionary taxes.'" "As contractors of the Philippine government, our members are committed to religiously pay the right amount of taxes only to the government," it said. "In the pursuit of our mining projects, we uphold the human rights of all stakeholders, especially those in our host communities. We will remain to be the Filipino people's partner in progress in the areas of job creation and livelihood promotion, educational advancement, community development, health and sanitation, infrastructure, increased government revenues, and poverty alleviation," it said. "We will continue to strive to minimize the negative impact of our activities, products and services on the environment, on people and on communities where we operate," it added. The chamber asked the Aquino administration to provide protection for investments in mineral development, a major component of the Medium-Term Development Plan. It added though that it is heartened by the assurances of President Aquino, through Executive Secretary Paquito Ochoa Jr. and Interior and Local Government Secretary Jesse Robredo, that the perpetrators of the recent attacks in Surigao del Norte will be brought to justice. "We also ask the Palawan anti-mining movement to refrain from spreading half-truths and outright lies in its shotgun approach to stop minerals development not only in Palawan but, effectively, in the whole country as well," the chamber said.